If you’re looking to immerse yourself in the mountain wilderness of the Southern Appalachians, then stay at the charming rustic cabins available at Blue Ridge Parkway Cabin Rentals. Our rentals are some of the only cabins near Mt Mitchell NC that are located off the Blue Ridge Parkway. 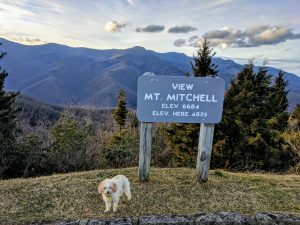 It’s said that the dramatic summit and incredible views at Mount Mitchell served as inspiration for one of the country’s very first state parks. A maintained network of trails winds through the spruce-fir forest and open to sprawling mountain vistas, trickling streams and a campground that can accommodate up to nine tents. Those staying in cabins near Mt Mitchell NC are privy to the state park’s various events and programs. Learn about everything from native wildflowers to the diverse species of local mammals through guided tours presented by park rangers. Or assist in maintaining the park’s beautiful environment and scenic trails during the Earth Day Trail Clean-Up. 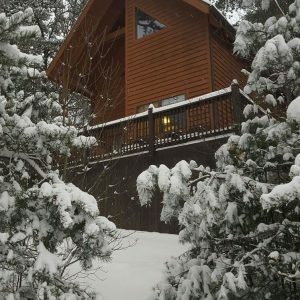 Located just twenty-five minutes from the state park, our cabins near Mt Mitchell NC are perfect for those who want to explore all the natural attractions that the High Country has to offer. Our rentals are located right off the scenic highway, and are also surrounded by the beautiful Pigsah National Forest. Take a break from the fast pace of your daily life with a getaway to our secluded cabins. Enjoy a cup of coffee on your private front porch and catch an early morning sunrise. Or maybe you’d rather spend the morning exploring the dozens of trailheads located just off the parkway. Kayak on the nearby inland lakes or putt around on area golf courses for a relaxing weekend. But if you’re looking for more heart-pumping action, you’re just a short drive away from white water rafting tours, high speed zip lines, mountain bike trails and three ski resorts. When you’ve finished exploring all the area has to offer, head back to our cabins to recharge. With queen beds, ceramic bathtubs and a private hot tub, there are plenty of ways for you to unwind. Flip through over 150 channels of satellite TV or gather around the outdoor fire pit for hours of entertainment. And with a fireplace, ceiling fans and air-conditioning, you can keep comfortable no matter what time of year. Don’t wait – book your reservation at one of our two cabins near Mt Mitchell NC today to lock down your stay at one of the most beautiful locations in the High Country.